The Grand Palace is a beautiful gold tipped series of buildings over 200 years old and since 1782 has been the official residence of the Kings of Siam. The Golden Triangle is where the Mekong River meets the Ruak River and is known locally as Sop Ruak, but to the rest of the world it's the Golden Triangle. Thailand has a lot of Festivals and visitors are very welcome to join in local celebrations, and most festivals and events offer a unique insight into local customs and traditions. Thailand's floating markets with their rickety wooden boats are a great way to spend some time browsing the local produce. Pick a market, and arrive early to avoid large crowds and bag the best bargains, always try to haggle but whatever you do, don't forget your camera. 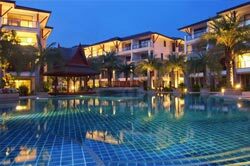 Things to do in Thailand Thailand Holidays. A Tuk Tuk has snug sofa with a small engine and a colourful hood, the tuk tuk is perfect for dodging lorries, swerving sidewalks and jamming taxis. They are the cheapest and by far the most fun travel option in Thailand. Meanwhile Grand Palace with it's collection of intricately painted white and gold temples offer religion and history that give you a quick burst of Thai culture in a 30 minute whip a round. Just don't forget to ply on the layers as a sign of respect. As an alternative to the tuk tuk, the long boat down Bangkok's Chao Phraya River is another way of soaking up the city's culture. On the open, and pretty murky waters, you can make a few purchases, watch the locals at work and see the city's epic monuments in the background. Do like the locals and munch on the crunchy delicacies of Thailand. Ignore the hard shell or weird pincers and try to enjoy the taste of some sweet and savoury bugs. You can find insects for sale on most street stalls or markets in a number of places around the Thailand so don't be afraid to try. Try them if you dare! The capital of the Ayutthaya province is located in the valley of the Chao Phraya River, just a short train ride from Bangkok. The once royal city now overflows with crumbling temples and religious ruins, which is why it is protected as a World Heritage Site. Grab an all-day chauffer, aka tuk tuk driver, and visit just a few of the temples to see some pretty sites and golden buddhas. Wat Phra Chettuphon Wimon Mangkhlaram Ratchaworamahawihan, or The Temple of the Reclining Buddha as it's more commonly known, does what it says it is the resting place for the reclining Buddha. The golden statue is 43 meter long so pretty impressive. Located just opposite the Grand Palace it's easy to get to and one to be crossed off the list. At 27 metres tall, Bangkok's Giant Swing stands amidst the city's other skyscrapers. It previously played an integral role in annual swing ceremonies - yep they exist. Teams of Thai men would compete to launch themselves off the swing to try to catch a sack of coins fastened at the top of the pole. Not surprisingly many men died in this fierce comp and today it sits as a big, giant even, piece of history. This is a Bangkok department store that has somehow become lost in time. It was once the first of its kind selling foreign goods and showcasing Thailand's post-war wealth. Entering from Bangkok's Chinatown it is hard to tell what is for sale and what is not. Many of the items date as far back as 50 years ago, the deco is yellowing and the aged mannequins are a little creepy. Looks like time travel is finally here. Krabi, on Thailand's west coast, is a popular departure pont for those going to Koh Phi Phi, where The Beach was filmed, as well as 80 other islands just a short boat ride away. 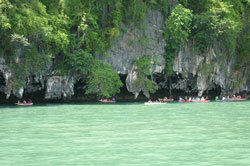 However, Krabi is also the gateway to a number of national parks, including Railey. Take a boat from Ao Nang to Railey and visit the many caves, go rock climbing or simply watch the romantic sunset across the Andaman Sea from the viewpoint on the peninsula. These are some of the Things to do in Thailand. 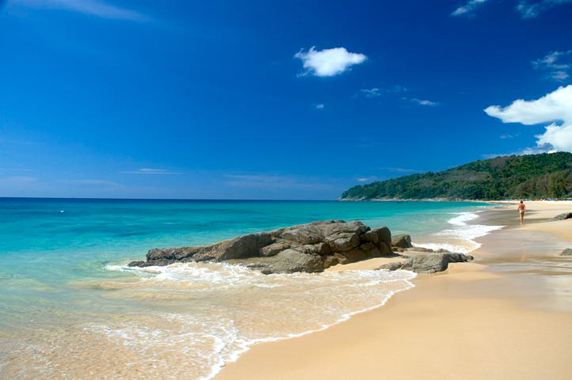 Thailand has over 5,000 miles of coastline just waiting to be explored. Travel by long-tail boat and discover as many beaches and islands as possible. 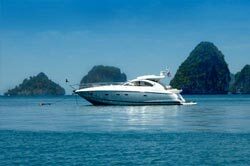 Island hopping in the Andaman Sea off of Phuket and Krabi can be a lot of fun. The elephant is Thailand's national symbol and a well revered animal. You can go on an Elephant Trekking adventure or encounter them working or by the side of the road all over the country.